The goal of China Antitrust Law Journal is to provide high-level practical and conceptual guidance and general training for use in understanding the concepts and protocols involved in vetting business agreements for EU and U.S. competition law compliance. 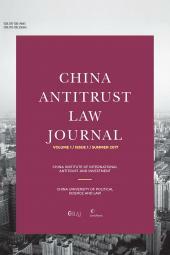 The Summer 2017 issue marks the launch of the China Antitrust Law Journal, a new periodical developed by the China Institute of International Antitrust and Investment (CIIAI) together with LexisNexis, in recognition of the growing importance of China to the global antitrust community. It is the first and only law journal in the field of competition law focused specifically on the People’s Republic of China (PRC) and Hong Kong, but with an interest in issues relating to the wider Asia-Pacific region and beyond. The Journal also publishes pieces of global interest in the fields of antitrust law and economics, comparative studies, theoretical and empirical research, and even multi-disciplinary contributions. 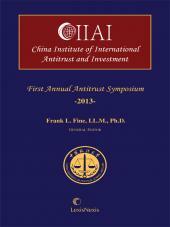 It covers a wide range of antitrust-related topics, including but not limited to: conduct (e.g., cartels, anticompetitive agreements and abuse of market power); public and private competition law enforcement; criminal enforcement; mergers; agency cooperation; investigation and sectoral studies. The CHALJ welcomes the submission of original articles not previously published elsewhere. Exceptional antitrust experts from all over the world sit on our Editorial and Advisory Boards. We will be very interested in receiving scholarly manuscripts that may have an impact on law, economics and enforcement policy, particularly when challenging antitrust shibboleths or confronting novel issues relating to the new economy. This being said, we also wish to publish articles that explain Chinese antitrust developments, decisions and policy to a Western audience, particularly when greater clarity and analysis is obviously needed. Articles will be reviewed by the Editorial Board and will be subject to a double-blind peer-review process involving scholars and practitioners. Article submissions and requests for guidelines relating to submissions should be sent to Frank Fine, Editor-in-Chief, at frank.fine@skynet.be. Any questions about work written originally in Chinese should be directed to Michael Gu, Co-Managing Editor, at michaelgu@anjielaw.com. has been practicing EC competition law in Brussels since 1986. He is currently Head of International Antitrust at DeHeng Law Offices, a major Chinese law firm, and Director of EC Competition Law Advocates, which is engaged in the practice of EC competition law before the European Commission and Courts, the provision of adversarial and legislative support services to national competition authorities, and the provision of tactical and logistical support to parties involving in national competition law investigations and antitrust litigation. Mr. Fine is also the Executive Director of the China Institute of International Antitrust and Investment, established in March 2012 under the auspices of the China University of Political Science and Law, where Mr. Fine is Visiting Professor of Competition Law. He is currently the General Editor of the LexisNexis three-volume loose-leaf treatise, European Competition Laws. In 2006, Mr. Fine authored a book with Sweet & Maxwell entitled, The EC Competition Law on Technology Licensing. He is also the author of one of the seminal works on EC merger control, Mergers and Joint Ventures in Europe: The Law and Policy of the EEC. Mr. Fine obtained his law degree from Loyola Law School (Los Angeles), where he was Editor-in-Chief of the Loyola International & Comparative Law Journal. He subsequently obtained an LL.M. (with honors) and Ph.D. in EC Competition Law from the University of Cambridge in England. He is a Fellow of the American Bar Foundation and has been Vice Chair of the ABA Antitrust Section’s Cartel and Criminal Practice, Intellectual Property, and International Committees, as well as a member of the Section’s Civil Redress Task Force. Mr. Fine is listed in European Legal Experts (Belgium; EU and Competition) and Asia Law as a Leading Lawyer (Competition). This paper examines issues related to state aid and state-owned enterprises (“SOEs”) in the context of a prospective European Union (“EU”)—China Free Trade Agreement (“FTA”). Drawing from existing FTAs and competition policies, the analysis concludes with several proposals for potential provisions that may enhance effectiveness in subsidies/state aid governance within the prospective FTA. This paper discusses the use of distribution restraints in China and Hong Kong, and attempts to develop a general framework for their analysis under the Anti-Monopoly Law (“AML”) and the Competition Ordinance (“CO”). However, since economic theory is ambivalent as to the effects of vertical restraints, and they may also serve pro-competitive purposes, the chosen approach must aim to control their potential problems while at the same time leaving room for an assessment of their potential merits and justifications. This article explores the application of China's Anti-Monopoly Law (“AML”), in force since 2008, to the Chinese pharmaceutical sector. Competition law issues affecting this industry are technical, complex and varied, and have been a priority in antitrust enforcement to date. While the general assessment of these problems by China's competition authorities greatly mirrors international practice, there are some unique traits that aim to deal with the specific local context. This article explores the potential stumbling blocks for transactions with Chinese state-owned enterprises imposed by merger review under the US Hart-Scott-Rodino Act and the European Union Merger Regulation, as well as reviews of the Committee on Foreign Investment in the US (CFIUS). The article then discusses the regulatory frameworks and hurdles transactions by and with such enterprises face in the U.S. and Europe, as well as the practical considerations that entities engaging in such transactions should keep in mind. The recent Vitamin C antitrust litigation in the United States has become particularly prominent in the discourse of the antitrust community. This article discusses the implications of the Vitamin C litigation and covers the application of the foreign sovereign compulsion doctrine in previous US cases. It also considers the repercussions of the judgment in subsequent trials, and particularly in situations in which US and foreign law come into conflict. At a time when fundamental policy decisions are being developed, this paper highlights the concerns of strict anti-injunction rules for standard-essential patents ("SEPs"), and defends the value of strong patent rights for an innovative economy. It questions criticisms that US antitrust enforcement is currently too lax in this regard, on the basis of the wide evidence available pointing towards the positive relationship between strong IP rights and innovation. This article discusses the 2016 decision of the US Court of Appeals for the Second Circuit in the Vitamin C litigation reversing a district court's decision to deny a motion to dismiss, which relied on international comity grounds. It provides a perspective from the European Union by covering the application of the state action doctrine by the European Courts and assessing the possible inconsistencies between jurisdictions. This paper offers a high-level view of the successes and shortcomings of the Chinese antitrust system since its inception. 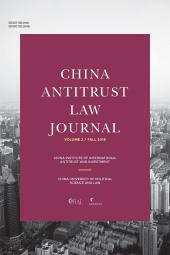 The authors point out that the system could have been structured to provide greater clarity in how cases are allocated among the three PRC agencies; they suggest that the courts should be more independent, and they propose that SOEs should not be immune from the full application of the Anti-Monopoly Law. The tensions between IP and competition law are a common occurrence in most antitrust jurisdictions, and China is no exception. Article 17 of the Chinese Anti-Monopoly Law (AML) can be used to control the misuse of such rights. This article discusses the extent to which the antitrust issues arising from IP can be tackled by the AML, and the action taken in China to date to prevent the potential problems. This article attempts to highlight the importance of inter-agency cooperation in merger investigations, and the benefits that are derived from joint efforts on the part of multiple competition authorities. It does so by focusing on the experience of the European Commission in this regard. While procedural and substantive challenges may exist, and the design and implementation of remedies still poses significant difficulties, the gains in efficiency and in the mutual learning process exacerbated by cooperation are crucial in a world where merger control regimes continue to proliferate.